^ 1.0 1.1 1.2 1.3 DNA分析称大脚怪为1.5万年前人类近亲(图). 新浪網科技時代. 2012-11-30 [2013-08-09] （中文（简体）‎）. ^ Is this Bigfoot's footprint? 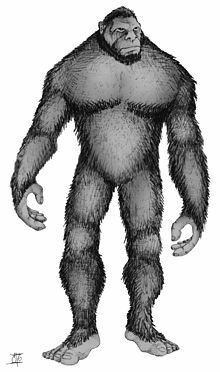 Men discover evidence of mysterious six-foot-tall creature in Mississippi woods. 《每日邮报》. 2014年9月1日 [2017年4月28日]. ^ Bigfoot spotted in Yellowstone National Park? Webcam footage captures what could be the elusive ape-like creature - and there are FOUR of them. 《每日邮报》. [2017年4月28日]. ^ Bigfoot or big fake? Expert claims video is the most compelling evidence of the mythical creature since the 1967 Patterson-Gimlin video… until he probes a little deeper. 2015年1月7日 [2017年4月28日]. ^ Is there a Bigfoot family in Yellowstone?Shadowy figures in Wyoming caught on Old Faithful webcam. 《每日邮报》. 2017年1月22日 [2017年4月28日]. ^ Is this a picture of the British BIGFOOT?Mother out walking her dogs snaps 'sasquatch' in Northern Irish woods. 《每日邮报》. 2017年1月12日 [2017年4月28日]. ^ 8.0 8.1 I had the ‘Bigfoot DNA’ tested in a highly reputable lab. Here’s what I found.. 《休斯頓時報》. 2013-07-01 [2013-08-09] （英语）. ^ Novel North American Hominins. DeNovo Accelerating Science. 2013, 1 (1) （英语）. ^ Bigfoot DNA Tests: Melba Ketchum's Research Results Are Bogus, Claims Houston Chronicle Report. 2013-07-03 [2013-08-09] （英语）.